There was an outrage at a wood processing factory, Njoku and Sons Wood Industry Limited, located on Aba road in Owerri, as the Imo State Government demolished the company despite a court order. As early as 7am on Tuesday, equipment belonging to the state government and its agents arrived at the company, which housed many structures, pulling down the structures. When Southern City News visited the company, its workers were seen packing the company’s belongings as bulldozers rammed into the structures. The Managing Director of the company, Allwell Njoku, told newsmen that there was no formal notice to the company by the state government concerning the demolition. He said despite a court order, the state government went ahead to demolish the factory. Njoku said, “It is very unfortunate that government officials today moved in to destroy our factory. This is a company that was established in 1956; it has between 400 and 500 direct and indirect employees. “We have the Certificate of Occupancy and every other document required by law, yet the state government insisted that it wants to take over the land. 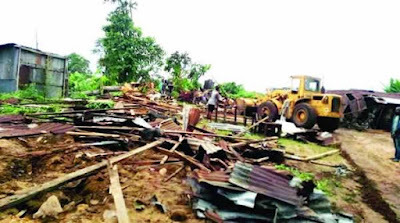 But an official of the Imo State Ministry of Works, who spoke on condition of anonymity because he was not authorised to speak, told Southern City News that there was no court order restraining the state government from demolishing the factory. The official said the company was built against the Owerri master plan, adding that government had issued two notices to the company about relocation, which the firm ignored.